Waves is a multi-purpose blockchain platform geared towards mass adoption, usability, performance and financial operations. The Waves Platform is an open blockchain designed to be an easily accessible, cost-efficient, and scalable trading platform that brings cryptocurrencies and digital crypto-assets to the mainstream. It enables the exchange of a wide range of composable financial instruments on a reliable, decentralized multi-purpose exchange that is transparent and auditable. 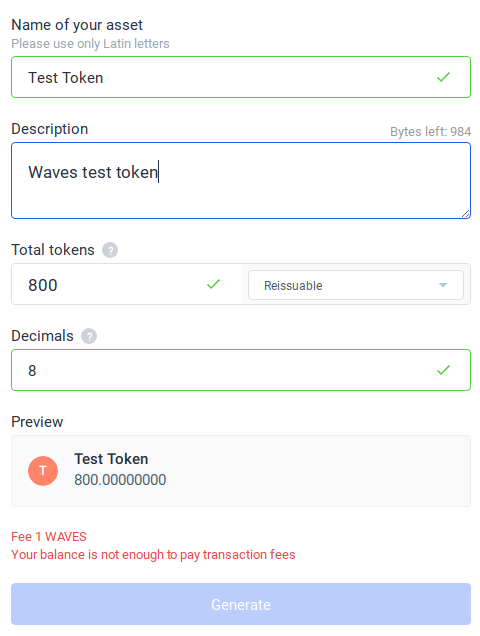 Integrating a wallet, decentralized exchange (DEX), and a tool for releasing custom tokens and assets into a single app, Waves focuses on custom blockchain tokens and assets operations. It includes national currency transfers maintained through authorized gateway operators, with full nodes carrying out transaction processing in a leased Proof of Stake consensus setting following the rationale of Nxt. One of the higher market cap digital assets, Waves adopts the approach originally realized by Nxt - the first successful custom blockchain tokens platform that was built from scratch, as well as the first working implementation of a Proof of Stake distributed consensus. Waves' CEO and co-founder, Alexander (Sasha) Ivanov had previously been involved with Nxt, along with Sergei Ivancheglo (also known as Come-from-Beyond) who is among the co-founders of IOTA today. As a company, Waves is Moscow-based and founder Sasha Ivanov graduated from the Faculty of Theoretical Physics of Moscow State University, pursuing postgraduate studies in Leipzig University. 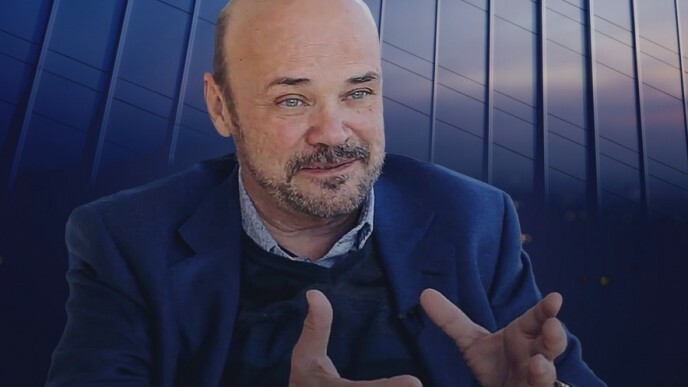 He had been involved in the development of software for payment systems and designing neural networks for financial markets forecasting before he founded the Waves Platform in April 2016. Waves then ran an ICO in June of the same year, generating around $16 million from about six thousand people. Waves gained momentum and popularity throughout 2017, climbing in rank by market capitalization and garnering attention on a number of occasions with its strong performance during overall market downtrends. Like Nxt, Waves makes possible the issuance and transfer of custom tokens through attachments supplementary to blockchain transactions, aiming to realize the under-utilized potential of the classic "colored coins" approach that first developed around 2013 around the Bitcoin blockchain and ecosystem at the time. Waves offers an extensible solution where new transaction types can be introduced through plug-ins on top of the core software module, allowing third-party developers to create any kind of transaction type or class in an Appstore-like ecosystem where users need to install the corresponding plug-ins in order to enable that functionality on the front-end. The term "colored coins" loosely describes a class of methods for representing and managing real-world assets by associating them with addresses on the Bitcoin blockchain. These may include stocks, bonds, futures, intellectual property assets, etc. While originally designed as currency, Bitcoin's rudimentary scripting language does allow for the limited storage of meta-data on the blockchain which can be used to represent asset manipulation instructions. Anonymous order books which are crucial for an industry-grade trading platform. Waves is molded around reproducing traditional trading and banking infrastructures by offering asset-to-asset trading that opens a whole range of possibilities, including trading of tokens pegged to national currencies and other real-world assets. The order matching component in Waves is centralized, while the transactions themselves take place on the shared ledger (i.e., blockchain), forming a fully functional exchange that is as fast and efficient as a centralized one without inheriting any of the associated drawbacks and vulnerabilities. This explicit centralization into supporting blockchain national currencies and BTC opens new opportunities for existing financial institutions, reducing their role to providing liquidity for their fiat assets and KYC/AML procedures while the maintaining payment infrastructure is fully outsourced to decentralized blockchains. In essence, Waves aims for optimizing efficiency for real-world applications and ease of use in providing an intuitive user experience and interface closely resembling customary online banking and brokerage applications (that just work, without the user needing to understand how things work under the hood or concern himself with technical details). The built-in decentralized token exchange is designed to smoothly facilitate fundraising campaigns, crowdfunding, low-cost airdrops, and the trading of financial instruments on the blockchain. Crowdfunding was initially one of Waves’ main use cases, integrating a decentralized KYC/AML into the system core as a decentralized reputation system intended to eliminate dishonest actors and unscrupulous behavior from the blockchain. Following the successful application of Proof of Stake on Nxt, Waves employs an iteration of PoS consensus chosen with considerations to do with reducing transaction times, increasing total throughput capacity and overall system efficiency without inviting over-centralization. Rather, Waves tries to take the best from both worlds in a well-measured and pragmatic approach aimed at providing an optimally efficient blockchain that functions as an industry-grade trading platform designed to bridge the gaps between traditional finance and the realm of cryptocurrencies and digital assets, standing to compete with central exchanges like Poloniex, etc. In a PoS system, each node that holds a balance in the network's native currency token has a chance (correlative to its balance) to produce a block. In Waves, light nodes do not download the blockchain at all but rely instead on full nodes for payment verification and network interaction – an approach based on the SuperNET lite client that has successfully been running on Nxt for over an year. In a two-tier context such as this, all nodes with non-zero balances are capable of staking rewards by expressly leasing their balances to full nodes, thereby increasing their chances of collecting transaction fees since that way they don’t have to stay online, while full nodes increase their chances of producing a block due to their increased balances. However, this type of account leasing is not equivalent to balance transfer – a light node can still use its balance and conduct operations normally. By leasing out their balance, light nodes effectively select the full nodes that will carry out most of the network’s payment processing. The reduction of the number of full nodes that can potentially produce blocks allows for faster confirmation times, lower latency and higher overall productivity of the system throughput while maintaining optimal decentralization. Waves' LPoS (Leased Proof of Stake) formula essentially allows Waves holders to profit by using their balances to secure the network while still retaining full control of their funds. Waves also makes use of another distinct approach to consensus called Waves-NG. Waves-NG is based on Bitcoin-NG (from “next-generation”), a proposed blockchain protocol (by Emin Gün Sirer from Cornell University in collaboration with others) that does away with Bitcoin’s bottlenecks and bandwidth latency limitations, allowing for greater throughput unlimited by block size and time interval constraints, but as fast as the network propagation time is (i.e., how long it takes to pass a message across the network). Bitcoin-NG is in that sense forward-looking, where the standard Bitcoin protocol is retrospective – in the sense that miners inscribe in the block what took place in the ten minutes that has just passed. 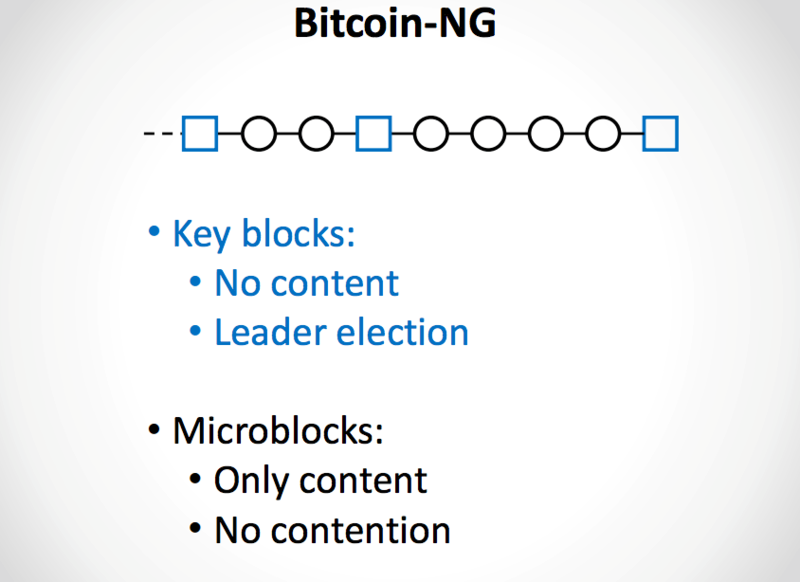 An Epicenter talk featuring Emin Gün Sirer explaining Bitcoin-NG in depth can be found here. Waves-NG is an improved and further refined adaptation of Bitcoin-NG to the Waves Proof-of-Stake system. The Waves-NG overlay allows for conducting micro transactions without the lags and interruptions of traditional blockchain systems, making it possible to sustain high loads and potentially handle hundreds of thousands of transactions in a very short time, rapidly and at low cost. 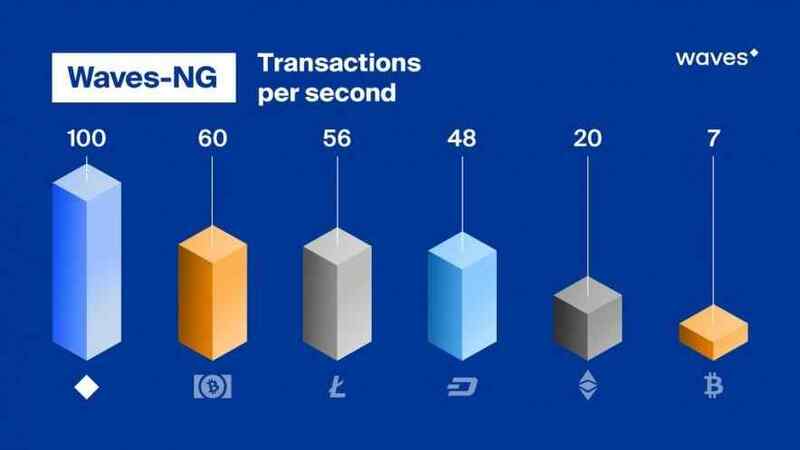 The velocity of processing on-chain transactions enables the network to easily tolerate regimes of increased activity and traffic such as the distribution of airdropped tokens or following crowd sales without bogging down the network or causing dramatic spikes in transaction fees. Standard transaction fees are 0.001 WAVES per transaction (around $0.0025 at the time of writing), however, it can be even cheaper with the purpose-built mass-pay function. Waves-NG has so-called liquid blocks which are made up of key blocks (also called "leader blocks") and micro blocks (a staple of the NG protocol). In this system, a validator node will be selected to create a key block via PoS (a kind of soft leader election) - that key block doesn't contain any transactions except the coinbase transaction (defining the node's public key) giving the node the right to create micro blocks from there on, which in turn are made up of transactions seen and registered by the node defined in the key block. The node adds transactions to these micro blocks and then broadcasts them to the network, signing and validating them with its private key. Also referred to as a generation transaction, a coinbase transaction is the first transaction in a block that is always created by a miner (or validator) - it includes a single coinbase. A coinbase is the special field designating the coinbase transaction that allows for claiming the paid out block rewards. This process occurs until a new node is chosen via PoS to generate a new key block. Once a new key block occurs the previous key block bundles itself with all the micro blocks it generated forming a new and complete liquid block that’s added to the blockchain. This continuous mode validation significantly increases effective bandwidth and speed of block production, allowing for conducting micro transactions without the delays characteristic of traditional blockchain systems. The NG protocol splits time into time periods called epochs, with each epoch having a chosen leader responsible for serializing transactions. Once a node generates a key block it becomes the leader and the following micro blocks do not affect the weight of the chain since they do not contain proof of work. Anybody can run a full node and ask participants to lease their WAVES to full node administrators, getting paid for securing the network. 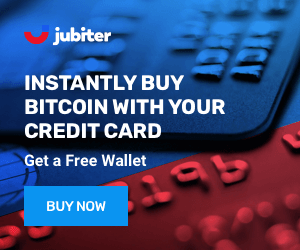 Matcher nodes, however, are a separate kind of node whose function is putting orders together and executing trades, while settlements take place on the blockchain. Orders are transferred to matchers through an encrypted channel and are revealed only when executed to curtail the possibility of market manipulation. These Matcher nodes basically connect sellers and buyers for a small commission and in principle, any full node can also become a Matcher – the Waves client connects to Matchers at nodes.wavesnodes.com by default. Since orders and trades are executed at high speed and there is no need to wait for the next block to know if a trade has been executed, this configuration gives speed at the level of centralized exchange with the security of a decentralized protocol. 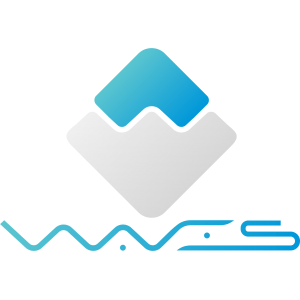 Waves enables the storage and exchange of external currencies and assets on its blockchain through an established Coinomat gateway: Bitcoins or any supported external coins are sent to a user’s personal Waves address via standard transfer and after deposit the user receives a proportional amount of BTC/ETH tokens (wBTC/ wETH or wavesBTC/wavesETH) on the Waves blockchain with every single wBCT/wETH token correspondingly supported 1:1 with a legitimate Bitcoin or Ether. 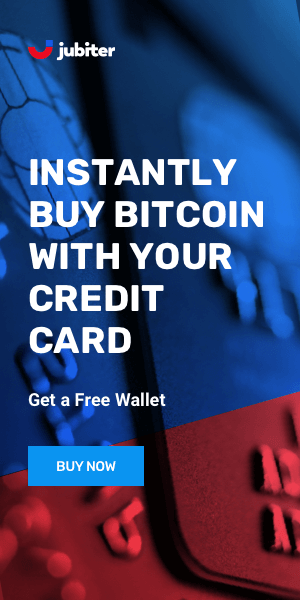 After requesting withdrawal, Bitcoins or any other supported external coins or assets are transferred to the gateway side as wBTC (Waves BTC) tokens, then the gateway processes them and finally sends back Bitcoins as external BTC transaction (i.e. wBTC -> Bitcoin gateway -> BTC). For deposits, the process repeats in the opposite direction of BTC -> Bitcoin gateway -> wBTC asset. For transferring Ethereum, for example, the gateway charges 0.001 ETH for the gateway fee and a 0.001 Waves network expense fee. For fiat-crypto, Waves uses fiat gateways and users must be verified with the Waves KYC (Know Your Client) services partner, idnow.eu. 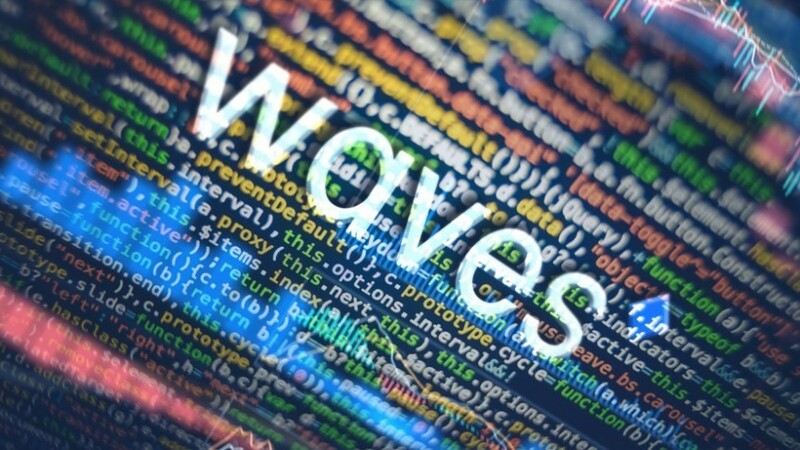 Waves is built on Scorex, a modular Scala (a functional programming language that targets the Java Virtual Machine) framework for building cryptocurrencies, blockchain applications, modeling networks or testing new consensus algorithms. The Scorex 2 Framework, presently backed and developed by IOHK, has a concise, easy to learn and work with code base. The framework allows for rapid prototyping and provides a testbed for proof-of-concept implementations that make it easy to change and swap out different blockchain components, choose from and incorporate a variety of protocols, transactional structures and underlying networking infrastructure. All the components of Scorex are built with flexibility and performance in mind and include existing blockchain solutions (pluggable protocols, state models - UXTO and account-based, etc.) as well as experimental prototypes, enabling the building, design, and implementation of unorthodox as well as known and time-tested cryptocurrency infrastructures. In comparison, the Bitcoin code base has over 100 thousand lines of C++ code and Nxt more than 45 thousand lines of Java code, while Scorex 2 only has about 4 thousand lines of code, making it much less demanding and easy to learn once understanding the general concepts abstracted by the framework. As a framework, Scorex is similar to Hyperledger's blockchain suite currently developed by the Linux Foundation, though Hyperledger's focus is more on permissioned, private blockchains. 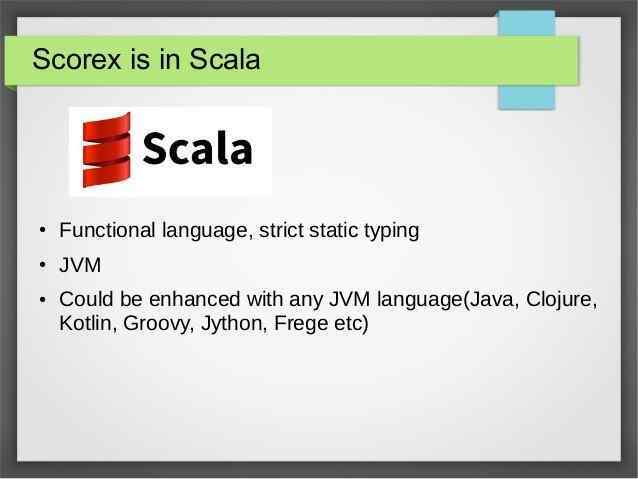 While conceptually similar to Nxt, Waves builds on Scala and is highly modular, prioritizing usability, simplicity and clean engineering. Waves is intended for mainstream business applications that don't impose any unnecessary technical hurdles upon users and targets demands where they currently are - asset tokenization, crowdfunding, creating loyalty or voucher tokens, easily sending money across borders, etc. Waves differs from Nxt in that it provides faster trades closer to real-time and unlike Nxt where everything is traded against the platform's own native currency, Waves allows for assets to be directly traded against each other. As a service provider associated with Nxt, Coinomat was the first instant exchange of its kind that was launched by Ivanov in 2013, the general idea of which was later taken up and popularized by ShapeShift. The comedown from the ICO hype over the past year coupled with the poor performance of many projects that were crowdfunded large sums of money have led many developers to move to token airdrops instead - a strategy for standing to compete with central exchanges like Poloniex, etc.distributing newly-minted tokens with some platform utility function to groups of users of some other asset in order to quickly acquire an active user base and generate interest. Conducting airdrops has become a simpler way of pushing a blockchain project to the global cryptocurrency community but there are significant transaction costs accompanying such coordinated mass scale transactions. Waves has emerged as one of the most efficient and low-cost platforms for conducting airdrops due to its design and it is customized to meet and accommodate for those exact needs. Earlier in 2017, Waves partnered with Deloitte to develop a legal and regulatory framework for furthering adoption of blockchain technologies (Waves is notably invested in sensible regulation, best practices, guidelines, education of the public, etc.) and in July, Ivanov announced the going forward with implementing an ERC-20 gateway and the integration of cross-chain atomic swaps. At present, Waves seems to above all be comparable to Stellar Lumens in that they share similar goals, emphasizing the advantages of open blockchains in terms of financial freedoms and establishing themselves as regulatory compliant platforms for running ICOs, crowdfunding, loyalty programs, etc.